'Tis the season to be jolly, they say. Nothing makes an EVE player jollier than the Code--with the possible exception, if I may, of more Code. At about this time each year, the good citizens of the New Order find themselves drawn back to that classic tale, A Highsec Christmas Carol, first published on MinerBumping on December 25, 2013. And Sasha Nemtsov's audio version enhanced the Christmas treat--one already almost too good to be true. You are too kind. He should of gotten a dirty piece of coal to go along with his dirty coal heart. This is great stuff Sasha! Merry Xmas! This carol filled my heart with joy, thanks Sasha. Even outside of game, when I'm at work on Christmas day, I enjoy content from the CODE. And I'm not even in the CODE. Thanks lads for what you bring to the game and have a Merry Christmas. Thanks, and the same to you and yours! You don't have to be in the CODE. Alliance - I'm not (they wouldn't have me with my skills...). If you're a supporter of the aims of the Code, then in my book you're a member of the New Order of Highsec. Come on in! This is a wonderful piece and makes me proud to be a member of the New Order. Well done, Sasha! 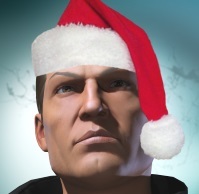 Merry Christmas to all of James alts enforcing the CODE this Christmas! James bless us, every one!